Boarder Patrol (Orca Sports Spring 2010). A Canadian Children’s Book Centre’s “Best Books for Kids & Teens 2011” selection. I was in the trees and three turns down before I noticed that something was wrong. My bindings were loose on the board. They rattled when I turned. I struggled for control, but I was going too fast. My board shot free. It hurtled down the hill without me. I hit the snow hard and flipped, my bindings still attached to my boots. It hurt. I tucked and rolled. I was still in the trees. Bad place to fall. 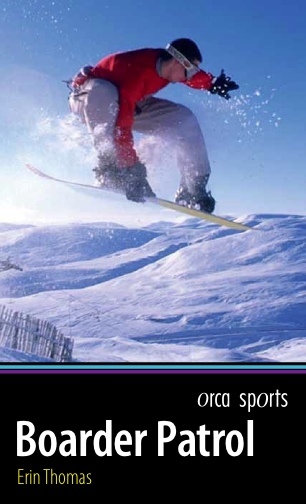 Orca’s sports books are geared towards reluctant readers and feature athletics mixed with adventure.